GUYS. I HAD ANOTHER RUNDISNEY NIGHTMARE. It started out innocuously enough. 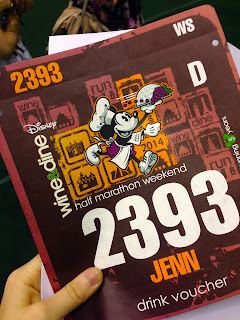 I was at next year's Wine & Dine Half. I went to the expo. I loved, I laughed, I lived. Went to my hotel. Futzed around. It was 6pm. Suddenly I realized - I had left the expo without ever picking up my bib. I mean, who needs it? Given the newfound portentous nature of my race nightmares, this has me worried. If you see me at the Wine & Dine Half 2016 expo, check that I have my bib. If I don't, SMACK ME ACROSS THE FACE. Do you have running nightmares? Are they as ridiculous as mine? Have no fear. As an honorary member of Team Can Am, we got this. I can always count on Can Am to smack me in the face when I need it!